Dentistry has changed! We are now able to diagnose quicker and more precisely with digital radiography. 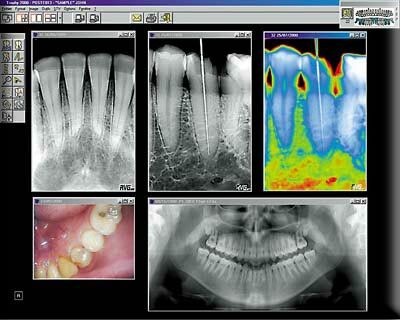 This page will introduce you to digital x-ray systems that we utilize at our Jackson Heights location. Conventional X-rays are a thing of the past. They are small, low resolution, bad for the environment due to harsh chemicals needed for processing, and require much more radiation than is necessary with the newer digital technology. We believe in what is best for our patients, that is why our facility only utilizes advanced digital radiography. Conventional X-ray: Bad for the environment, small and hard to read, more radiation needed than in a digital x-ray system. Do you have to take X-rays? What seems like a normal tooth may have a problem right underneath the surface. This is why your dentist takes x-rays. You can see by the photo that the teeth look fine. But when the radiograph is taken you can see an interproximal cavity in-between the teeth on the right side of this upper bicuspid tooth. The bacteria that eat your teeth Streptococcus mutans are facultative gram negative anaerobic bacteria that cannot live in oxygen which is why they grow best in-between the teeth where there is no air containing oxygen and can only be cleaned with dental floss. Did you floss today? 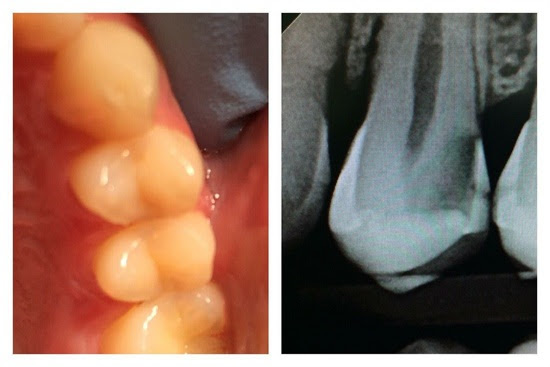 When was the last time you had a dental exam that included x-rays? Digital X-ray systems are irreplaceable tools that benefit the patient. The images are displayed instantly versus conventional x-rays where you have to wait up to 5 minutes for the film to develop. This saved time will allow you to get to your other tasks faster. Digital X-rays allow us to see a full screen image of your teeth letting us see a larger, clearer picture than ever before while also allowing you to participate in your examination. We are able to keep track of your teeth and compare them exam to exam or even year to year. This lets us identify problems earlier and present you with options faster. This new technology is also better for the environment as we no longer have to use toxic processing chemicals and lead foil that is in conventional dental film. Finally, with a fraction of the radiation required for conventional x-ray system we are able to prevent unnecessary patient exposure.